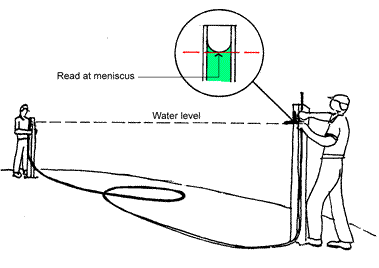 In this article you will learn how to use a water level. It is best for your projects where it is important to maintain a specified height over a large distance. Water levels are particularly good for gauging the level on large structures such as mobile homes. Water always finds it own level and so it is an excellent choice. When the length of a traditional torpedo level will not span the distance between the points to be leveled. Obstructions will block light or laser Laser beams. This will generally be anything over 4 feet. So set up the level of the water inside the bottle to the desired height and the fluid in the tubing will find its own level. For instance, level with the transom board for a deck. Where ever you locate the tube at the other end the water level will be equal. You could use a water level to judge the height of your deck posts to assure the finished deck surface will be plumb and level.